In just a few minutes from us here at Cape View Clifton, you can be at the water's edge with some of the most spectacular beaches on earth to explore. Take a moment to browse through our quick guide to the best beaches in Cape Town and why you should put them on your holiday checklist. Plus, your stay with us includes your very own personal concierge, on hand to help you plan your excursions, transfers and also making sure you head off with a picnic basket packed with delicious treats for all your adventures. We will do everything to ensure your visit to the Mother City is a memorable one. Soft white sand, crystal clear water and large granite boulders are just a few of the things that make Clifton’s beaches so picturesque. It’s one of the most glorious stretches of local coastline, and we are lucky to have it on our doorstep. The beach is naturally divided by boulders into four bays, which are known as Clifton First, Clifton Second, Clifton Third and Clifton Fourth. Clifton Fourth is arguably the most popular and the best place to swim, with tranquil waters and lifeguards on duty. Stretching from Noordhoek to Kommetjie, Long Beach is one of Cape Town’s most pristine and well kept beaches. One of the most exciting ways to explore this part of the world is on horseback. 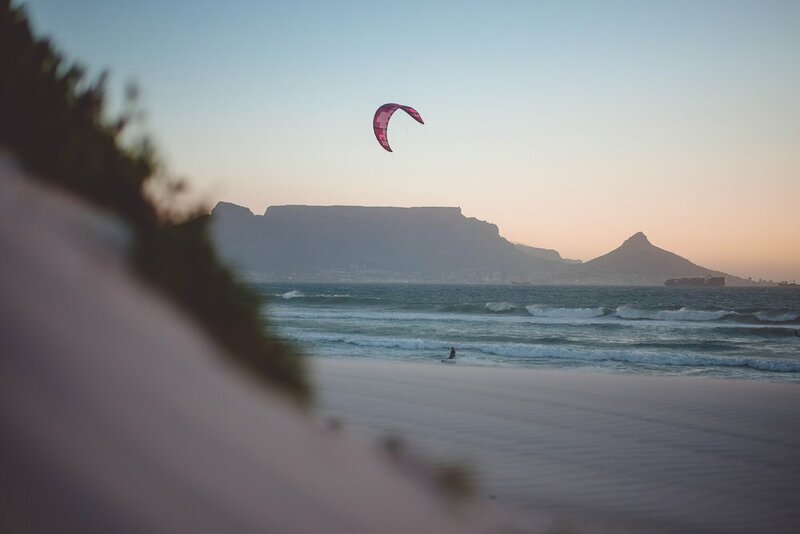 Riding along the vast expanse of white sand at the shore’s edge while taking in the stunning views is one of those must-have experiences in Cape Town. Brightly coloured beach huts and perfect surf make Muizenberg beach the ideal family outing. Treat the kids (or yourself) to surf lessons with Gary’s Surf School – the longest-running surf school in South Africa – or enjoy lunch at one of the quirky restaurants that line the beach promenade. Added bonus? It is just a hop, skip and a jump away from must-see spots like Kalk Bay and Simonstown. Located down a steep set of stairs and surrounded by large boulders, Llandudno is one of the most beautiful beaches in Cape Town. Quieter than a lot of the city’s more popular beaches, it is the perfect escape if you’re just looking to relax and read your book in peace. It’s a small of slice of seaside paradise. You can’t visit Cape Town and not visit the African Penguins at Boulders Bay. Enjoy warm, island-like waters, swim through hidden tunnels, jump off the boulders and get up close and personal with a colony of African penguins. It’s a day at the beach like you’ve never experienced before, so make sure to add this to your Cape Town bucket list. And last but not least, make your way to Bloubergstrand – a beach that offers picture perfect views of Cape Town’s most iconic landmark. Cast your line of sight, and your camera, across Table Bay, where you’ll be able to see the best view of Table Mountain that the city has to offer. It’s a photographic opportunity not to be missed. Looking for the perfect Cape Town accommodation? Base yourself with us at Cape View Clifton, see all that the city has to offer and relax at the end of the day in absolute luxury. To book your stay with us at Cape View Clifton, please give us a call on +27 11 568 0384 or email us at reservations@rareearth.co.za.